With Oktoberfest around the corner and my love of good Microbrew I felt compelled to create this background. You learned how to craft various alcoholic beverages either at home or in a commercial brewery somewhere in the realm. Your philosophy of quality and diversity has served you well. Equipment: Artisan’s Tools (brewer’s supplies), set of common clothes, recipe book, lucky tankard, a belt pouch containing 15gp. 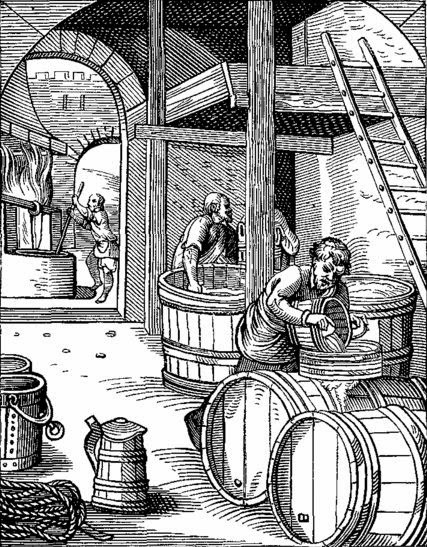 You have a reputation for crafting drinks with a stronger taste and frequently more alcoholic content than what most commoners are used too. In some cities and towns people have either heard of your creations are even tried them once. When other aficionados recognize you they tend to be interested in talking and very helpful. Because of this minor celebrity you may be able to gain access to important community leaders with relative ease. 1. I’m fanatical and obsessive about the brews I craft and drink. 2. I grow bored quickly crafting the same alcoholic potable over an over. 3. I’m a beer snob. I know arcane bits of knowledge about things brewed 1000 years ago. 4. Unless it’s Dwarven made its just flavored water. 5. I prefer to go with the trends when I craft various brews. I want to make money. 6. My goal is to win every competition I can until my brews are on the King’s table. 7. Did someone say hops? Please try this ground breaking brew. Bitter? No way! 8. I’m just as happy drinking a good brew as crafting it. 1. I know the secret ingredients to a renowned recipe from a famous brewery. 2. I’m still in debt to a dwarven brewer who took me in and taught me the trade. 3. I have been tasked by a wealthy noble to create a brew using completely outlandish ingredients. 4. I cannot resist visiting a new tavern to experience the local competition. 5. I promised an ill brewer I would finish his/her research into a unique recipe. 6. My family brewery was destroyed by a fire. I plan to return one day and rebuild it. 1. I really enjoy excessively partaking in most everything that I craft. 2. Alcoholic beverages crafted by others I find lacking and I’m boisterous about it. 3. I like to brag about my brewing accomplishments. 4. I often cut corners when I brew and hope I don’t get caught. 5. I’m not nearly as experienced at my craft as I lead others to believe. 6. I’m completely inflexible when it comes to brewing methodology.